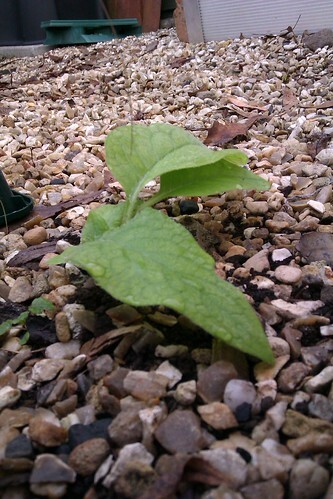 Last year, I took some root cuttings from one of my comfrey plants. I dug a hole next to the plant, rummaged around until I found some decent-sized roots and snipped off a few large-ish chunks. I then put them into small pots of compost, arranged the pots neatly in a sheltered corner of the gravel next to the shed and put them to the back of my mind. Until now. I stumbled upon the pots again when I was having a bit of a tidy up. The bare pots had by now all yielded thriving comfrey plants, their leaves soaking up the morning sun. They were getting a bit big for the pots and I figured it was time to plant them out. So I dotted them around some of the less full corners of the garden, ready to provide me with lots of material for comfrey tea. One of the plants had already put out particularly deep roots, which had snaked their way through the bottom of the pot, through the gravel, through the weed-suppressing membrane beneath the gravel and into the soil below. (Definite marks for persistence here.) I thought nothing of it as I chopped off the roots at ground level and got on with the task at hand. So I was a bit surprised today when I was doing my early morning rounds and stumbled across this little green plant bursting up through the gravel. Yes, it’s my comfrey plant. The snipped-off roots have survived and have produced a new plant of their own. And it’s now doing very well, thank you, and making its own way in the world. Yes, it’s a bit in the way. But it’s done its bit and is clearly extremely keen to grow. So I’ll wait until it’s a bit stronger and then dig it up, so that I can find it a more suitable home. As an enthusiastic but rather sporadic gardener, I shouldn’t be surprised by things like this. But I’ll never cease to be amazed by the will of plants to grow. Sometimes despite my best efforts to the contrary. This entry was posted in Gardening and tagged Gardening, Growing, Plants by Simon Perks. Bookmark the permalink.